One more post for today, and then I'm taking a break! Gary and Becky's good friends recently had twin boys. 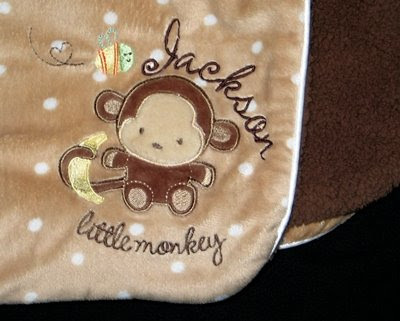 Their nursery is browns/greens and monkeys -- I bet I'd love it! To coordinate they purchased these baskets with liners, and I added the boys' names to them, using the Tinker Toy Alphabet from 8 Claws and a Paw. 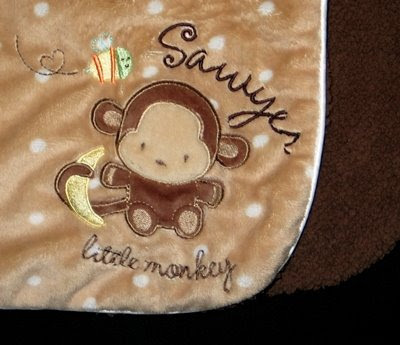 These minkee/fleece blankets already had the text and applique monkey stitch in the corner. I searched through my fonts to find one that matched the cursive text, and settled on Amelie from 8 Claws and a Paw. 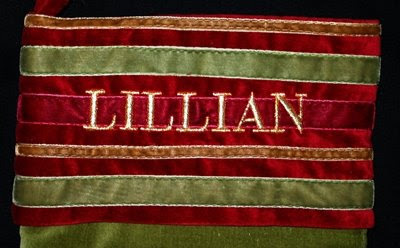 I used Embird to curve the letters, marked the center of my design, and then held my breath as the names stitched out. I was very nervous about getting the position right, and wasn't confident how well it would stitch on a thick blanket so close to the binding. I was amazed with the results. Prayers before hitting the start button are always worthwhile!! 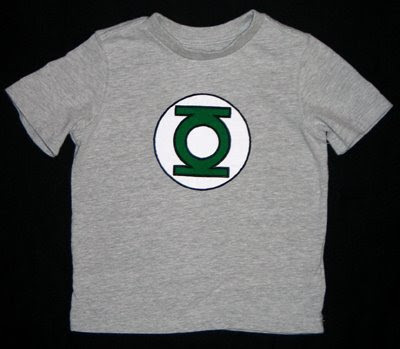 Sue contacted me about stitching some items for her new grandson, and I was happy to oblige! 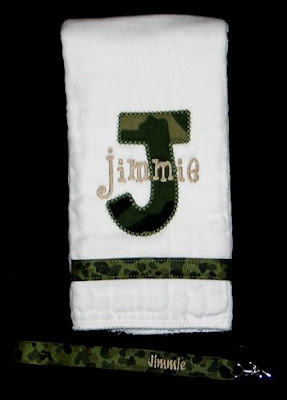 In keeping with the camo theme, I monogrammed this burp cloth. 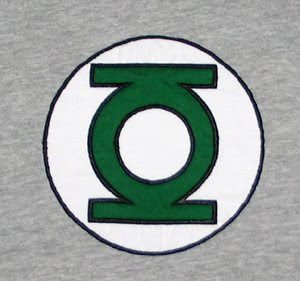 The applique J is from Embroidery Boutique's Fun Applique Alphabet. I used the Jason font from 8 Claws and a Paw for "Jimmie". Also note the camo ribbon pacifier clip (Embird Alphabet #8 on that). 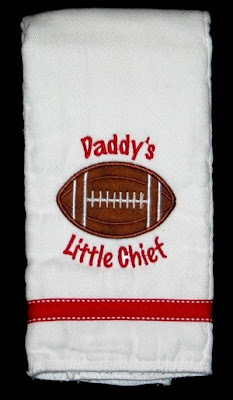 And finally Daddy is a Kansas City Chiefs fan, so this burp cloth is in honor of that. I used the applique from a football sucker holder design from Embroidery Garden (a freebie on her yahoo group) and I added the text with Embird Alphabet #8. 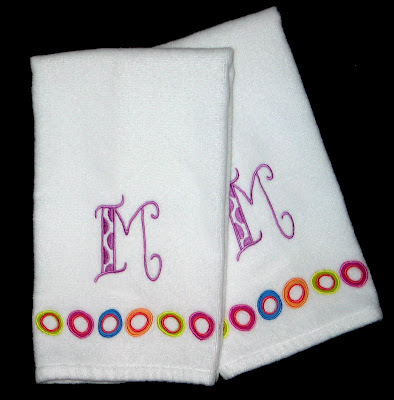 Rosanne asked me to monogram a couple hand towels for her daughter. 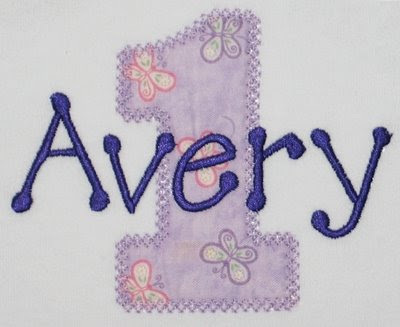 They were purchased at Target with dots already appliqued on (cute, huh?). I added the "M", which is from Five Star Font's Whimsy Dots. About a year ago Lily was born. 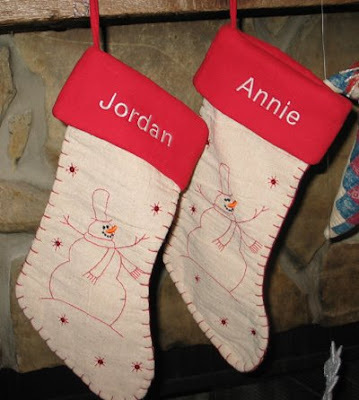 This spring her mom asked if I would monogram the stocking they bought for her at Christmas. 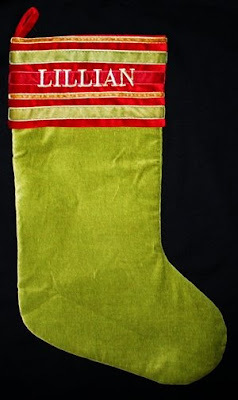 She gave me her husband's stocking, and my goal was to match the font, size, thread type and color. I should have taken a picture of John's stocking so you could judge how well I did, but I didn't. Here's Lily's stocking, ready to go for next Christmas! 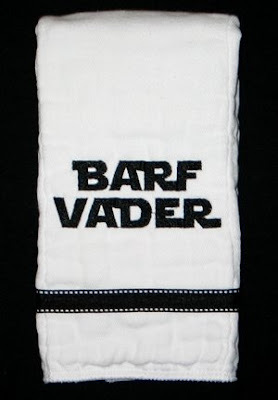 As I was stitching this, I remembered a couple other stockings I did but never blogged about. In December 2007 Susie bought a couple stockings for her daughter, anticipating a marriage proposal. 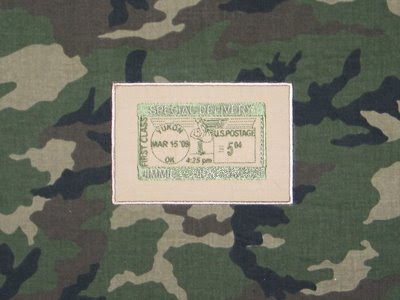 I stitched them at that time, but Susie decided to wait and give them as a wedding gift for their November 2008 wedding. Of course my December was a little crazy and I didn't think about them again until this week. :) I used Embird Alphabet #2 for these. No, I didn't actually stitch something for myself. 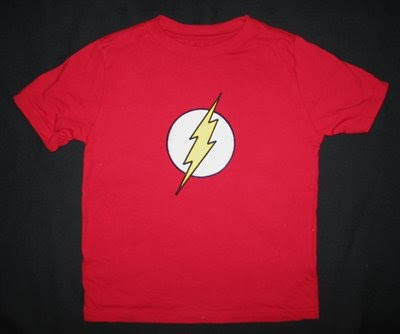 I did sew, but it was for a different birthday girl, pictures later. My blog got a much needed face lift, courtesy of my personal graphic designer/web/video/tech guy. Thanks Carlin!!! This post is way overdue, but it has been a crazy month! 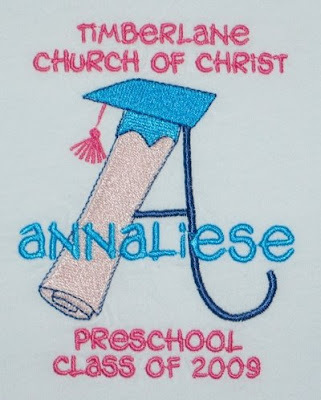 Last night was Annaliese's preschool program, and included in that was a brief graduation ceremony for the VPK classes. 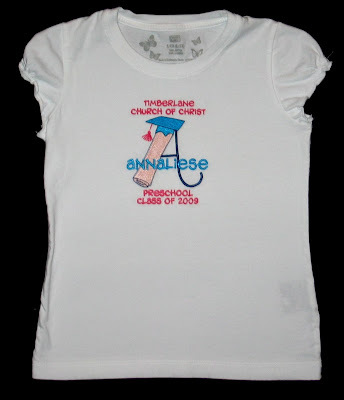 In honor of that, I made Annaliese this shirt. Here she is with her beloved Ms. Susie, who has been a fantastic teacher this year! 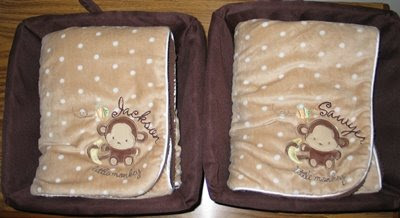 Melissa requested a baby gift for a family that just had a little boy. The mom and dad are huge Star Wars fans, so initially I suggested doing a monogram in the Star Jedi font. 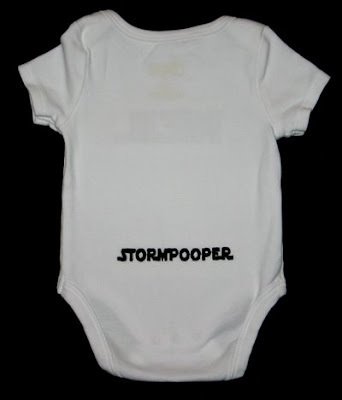 I also did a bit of google searching for Star Wars baby gifts, and came across a handful of cute phrases. Melissa picked a couple, Kathy digitized them for me and I stitched away! 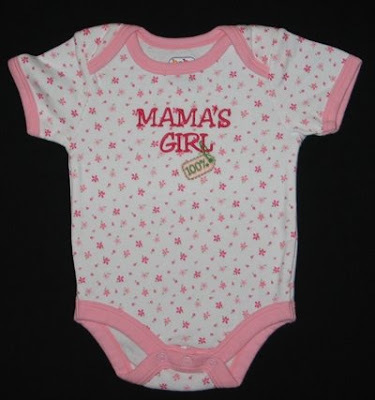 Tammy requested a onesie for her granddaughter to wear on Mother's Day, suggesting something like 100% Mama's Girl. 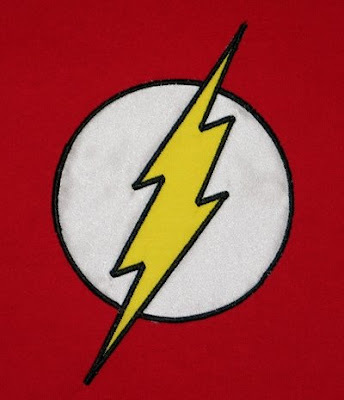 I immediately thought of Carolynn's 100% Club designs at ZippyDesignZ. 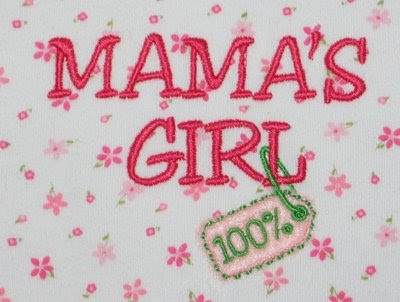 I like the text with the dangling tag, and thought I could just add "MAMA'S" above her GIRL design. However, even with Kathy's help using the right font, we were unable to get it digitized in the same manner as Carolynn's design, so I sent her an email asking for her help. Talk about customer service!!! She replied right away, cheerfully agreeing to help me out. 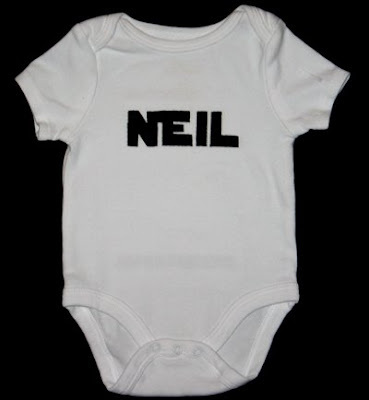 Before I was even ready to stitch the onesie, she had emailed me the custom design. It stitched out beautifully! Thanks Carolynn!! My good friend Terri is a photographer. She has a portrait session today with a little girl who has recently turned one. 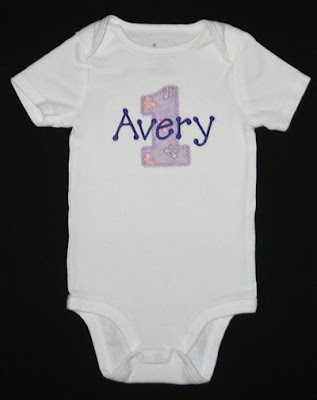 After seeing Ada's onesie, she requested a onesie for Avery, who will also get to wear Terri's lavender tutu for her picture. The dark purple thread matches better in person, this isn't the best photograph. Can't wait to see Terri's pictures!